Understanding how to read the circle of fifths will help you understand the relation between music’s major keys and their relative minor keys. A major key and its relative minor use the same key signature, which means they use the same sharps (indicated as #) and flats (shown as b) in their scales. When you read the circle of fifths, you’ll notice that the major keys are on outside of the circle. Opposite them, inside the circle, are their relative minor keys. At the top, you have the key of C major, which has no sharps or flats in its key signature. Each stop on the circle as you go clockwise from C is a key with one more sharp than the previous key. Each stop as you go down counter-clockwise from C is a key with one more flat than the previous key. 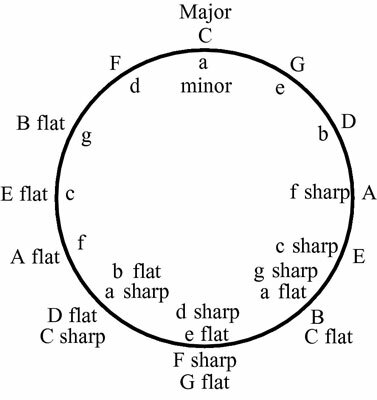 Use the circle of fifths to understand the relationship between major and minor keys. So, if you have the circle of fifths memorized (or have a picture of it handy), you can easily figure out what key a song is in. Simply count the number of sharps or flats in the key signature, and then move that many spaces around the circle of fifths, starting at C. Move clockwise for sharps, and counter-clockwise for flats. For example, if you see three sharps (F#, C#, and G#) in the key signature, start from C and go clockwise three places, and you’ll find that the song is in either A major or F# minor. Similarly, if you see five flats (Bb, Eb, Ab, Db, Gb) in the key signature (not a nice thing to do to a guitarist), you start at C and go five places counter-clockwise; that puts the song in either Db major or Bb minor.